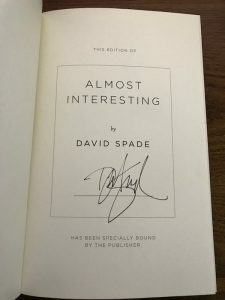 On a recent trip to Goodwill, I came across a copy of David Spade’s memoir. I grabbed it off the shelf and placed it in my cart without any consideration. As I continued to browse the store, I second guessed myself: Should I buy this book? I’ve already read it, and yes I loved it, but do I really need it in my collection? It’s $3, which is expensive for me for a used book. Sure, but it’s a hard cover in great condition. The battle waged on. Eventually my inner book hoarder won out over reason. 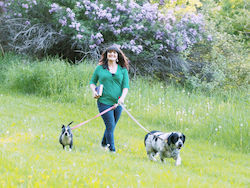 When I got home, I cracked the memoir open to look at the photos. Completely by chance, the book fell open to the title page and I discovered this is a signed copy! I’m proud of myself for following my intuition and buying the book, despite “reasonable” reasons not to. 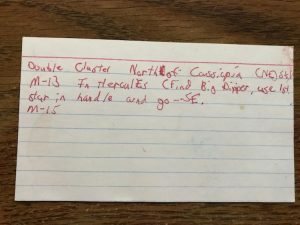 This isn’t the first time I’ve been surprised by something I’ve found in a used book. In fact, it’s one of my favorite things about pre-owned copies. Despite not enjoying previous readers’ highlighting/writing, I love to see what they left tucked inside a book. 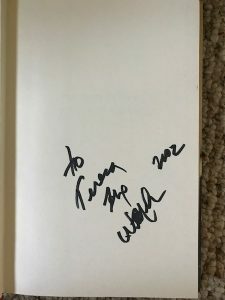 Besides the above story, I also found signatures from Ann Patchett and Willie Nelson in used copies of their books. 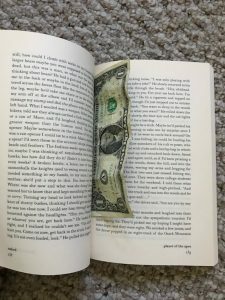 I once bought a used paperback for 35 cents, and two dollar bills fell out when I leafed through it at home. That’s a pretty good profit! I’ve found an occasional one here and there other times as well. 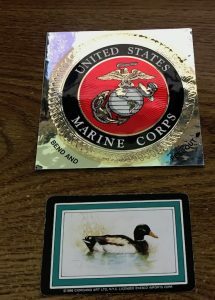 These are my favorite surprise to find. I get a glimpse into another person’s inner life. I once found a lawyer’s business card with an extremely specific note in tight handwriting on the back, obviously related to an arrest. I threw that away because it felt like bad juju! 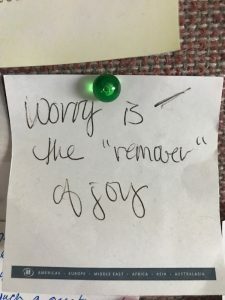 I keep this note tacked to the cork board in my office. These appear to be directions to find a specific star in the sky. I don’t come across photos often, and when I do I pitch them because it feels weird to have photos of strangers lying around. These particular ones ares so stunning I’ve saved them. They feel particularly special. I’ve blurred the face here for privacy reasons, but I don’t think that takes anything away from the images. 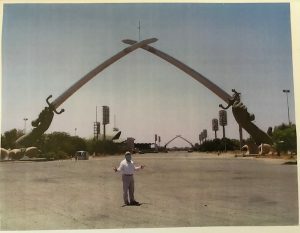 A quick Google search told me this is Victory Arch in Baghdad, Iraq. 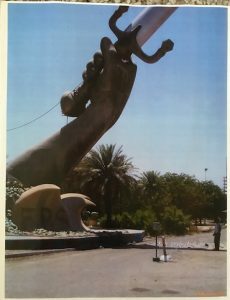 According to Wikipedia, demolition of the monument was started in 2007 as part of the effort to remove symbols of the Saddam era , and was challenged by the U.S. Ambassador. Restoration began in 2011. When I look at these photos, and hold them, I get the feeling I am witnessing history. I’m assuming they were taken by and of American soldiers. 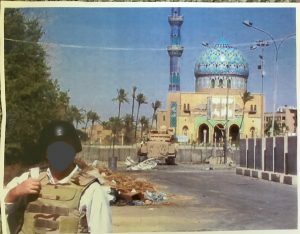 One of the photos is dated July of 2004. Considering they are on paper, likely made with an ink jet printer, that tells me something about the time frame they were printed. I find stickers quite often, I suppose they make for an ideal bookmark! Since I enjoy finding treasures in used books, you may wonder why I don’t look for them before I make a purchase. Honestly, it hadn’t occurred to me until I was writing this piece. While I do flip through checking for highlighting or significant damage to a book, I’m not ever looking for “extras” tucked inside. Part of the pleasure for me is that it is a surprise. 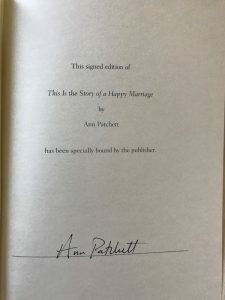 Sometimes I don’t find these items until I finally read the book, which in the case of the Ann Patchett book was almost a year later. Most empaths don’t like used items, so I am unusual in that regard. For the most part, I enjoy being around previously owned objects, even though it can be draining to my personal energy. Because I get so much more out of a used book than most other used items I buy, I feel a particularly strong gratitude for people who donate/trade/sell their used books so I can experience them. That’s part of the reason I like to gift/share my used books as well. 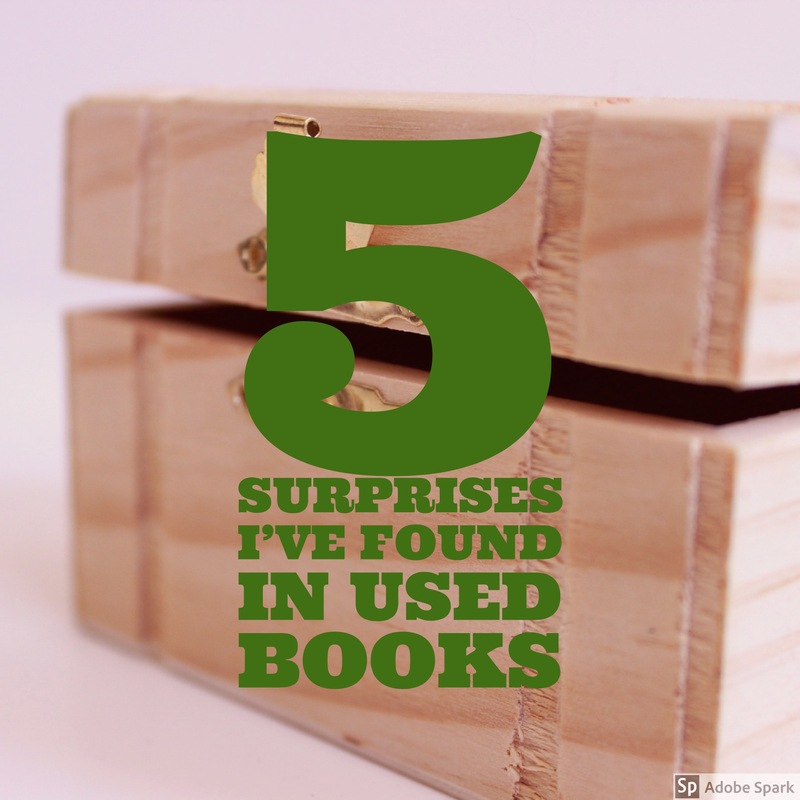 How do you feel about used books? Have you ever found a nice surprise in one? What do you think about my treasures I’ve discovered? !